Shop at EASYFUNDRAISING to raise funds for the club. See the full list of retailers which can raise funds for us. 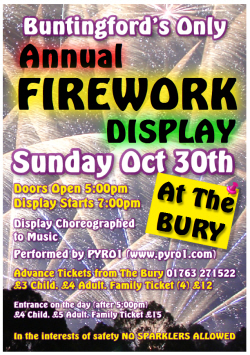 On Sunday 30th October the club is holding its annual firework display at The Bury. Again this year the display will be choreographed to music by Pyro1. Entrance is from 5:00pm, with the display starting at 7:00pm. We will also be holding a Fancy Dress competition for the under 10's - the winner will be given the chance to start the display using the 'Celebrity Button'; judging will take place at 6pm. As usual there will be a licensed bar, BBQ and a number of stalls to keep you amused before the main event. The display will be performed by Pyro1 who are a professional fireworks and pyrotechnic company; they have numerous credits including Edinburgh’s Hogmanay, Cheltenham Racecourse and the Royal Yacht Britannia. It should be a great display! Discounted tickets are available in advance from the bar at The Bury priced at £3 per child, £4 per adult or a family ticket for four at £12; call 01763 271522 now! Entrance on the night (after 5pm) will be priced at £4 per child, £5 per adult or £15 for a family ticket. Please note - in the interest of safety NO SPARKLERS ALLOWED - when discarded they can later cause injury. Advertise here for £50 per year. © Copyright 2002 - 2019 Buntingford Town FC. All rights reserved.